We spent over 40 hours researching and testing 12 different kinds of canister vacuums and found that cord length, suction, and attachments were most important. The Bissell Zing Bagged Canister Vacuum scored high marks in all categories and is our top pick. The powerful 12 amp motor that this vacuum has can handle fast vacuuming before company as well as deep cleaning. It works great on bare floors and carpets equally with just the flip of a switch. It offers 4 position height adjustments to choose from and a quick release pedal that allows the wand to be taken apart from the nozzle. There are several attachments as well. There are many different factors that have to be taken into account when you are choosing a canister vacuum. Things like price range, performance, power consumption, durability, attachments and more. You also need to determine what your specific usage needs are before you purchase one. There are many different models of canister vacuum on the market today. If you know the features to look for and the points to consider, sorting through all of the choices will not be overwhelming at all. Canister vacuums were the go to type of vacuum decades ago with all of their attachments and long hoses. When uprights came onto the scene, the canister became less popular. Due to advancements in technology, the canister vacuum has risen in popularity again. Even though it is not as popular as uprights, there are still people who prefer the design and style of a good quality canister vacuum. Bissell’s Optiflow canister vacuum has a powerful 12 amp motor and can handle everything from a fast vacuuming before company arrives to a detailed weekend spring cleaning. It has the versatility to clean both bare floors and carpets equally as well. All you have to do is flip the switch on the handle to “floor” and the canister motor runs by itself. If you do need to vacuum carpets, flip the switch to carpet and the canister motor and power nozzle motor come on to provide extra suction power. The 4 position height adjustment can be set to accommodate the height of the carpet so you get the best suction and cleaning action. A quick-release pedal allows the aluminum want to be separated from the power nozzle and all of the on board attachments add additional capabilities for deep cleaning. There is a floor brush, dusting and upholstery brush, crevice tool, and the pet hair turbine. The Optiflow technology ensures that there is a consistent and steady flow of air through the dust bag even when it is filling up with dirt and debris. The HEPA media filter, located behind the dust bag, captures all the allergens floating in the air, improving air quality for the family. The removable caddy makes dust bag changes super easy. The Bissell canister vacuum makes cleaning the whole house thoroughly simple and easy with its 24 foot cord and 6 foot swiveling hose that allows for plenty of movement and the rubber casing that protects the furniture and walls as you are vacuuming. This lightweight canister vacuum with convenient carry handle is the perfect machine to take care of all your vacuuming needs. The lightweight HEPA ready Sanitaire canister vacuum is great for vacuuming wood floors, tile, linoleum and other hard surfaces. It has a carpet cleaning attachment for area rugs and carpet that is low-pile. The telescopic metal wand easily reaches difficult to reach areas such as under furniture and ceilings. The 20 foot, double insulated commercial power cord allows for plenty of movement and is very durable. 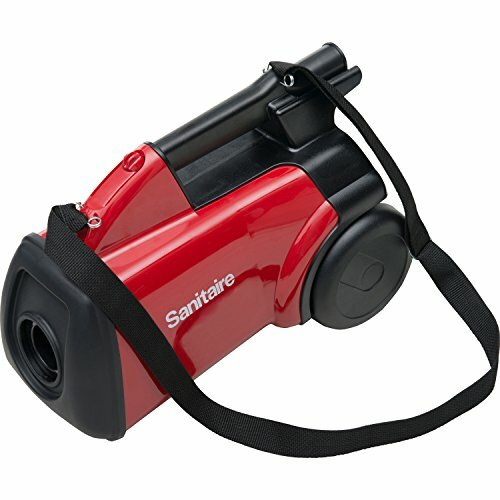 The shoulder strap aides the user in carrying the vacuum up stairs or for other types of cleaning. The 7 foot hose and attachments allow for deep and thorough cleaning. The sealed filtration system prevents dust from being able to leak out. With the HEPA exhaust filter, this canister vacuum retains 99.97% of pollens, dust, mites and other allergens. This vacuum, when used with the HEPA filter, is a big help for those who suffer from asthma and dust related allergies. The nine inch cleaning width and 1200 watt, 10 amp motor takes care of cleaning in a way that leaves your home feeling and looking fresh. The Sanitaire canister vacuum comes with a 2 year warranty. Hoover is a well known and well trusted name in vacuums. It brings buyers an easy and comfortable cleaning experience with the Hoover CH30000 PortaPower Commercial Canister Vacuum. This lightweight machine cleans large spaces and tight, harder to reach spaces with all of its convenient features. Vacuuming stairways, hallways and around sharp corners is super easy with the easy to use design of this canister vac. It is very lightweight, weighing only 8.3 pounds, which helps reduce fatigue, especially when vacuuming up flights of stairs. This machine can be used to vacuum draperies, upholsteries and inside your vehicle as well. This model can use both a reusable commercial cloth bag, and a paper dust bag. There are plenty of reasons to purchase this canister vacuum from Hoover, including all of the great attachments and the extra long 33 foot cord that allows for plenty of movement while you are vacuuming. Canister vacuums are a great way to get your home clean even in this day and age of upright popularity. The attachments they offer and extra features are giving attention to the fact that they are still one of the best ways to clean your home. We took a look at 20 of the most popular canister vacuums and considered their performance, cord length, wattage, amperage, attachments, hose length and more and narrowed down all those canister vacuums to the top three that topped the charts in all of those categories. Any one of these three choices would be an excellent way to get your home dust and dirt free. We have put together a detailed buyer’s guide that will provide the information you need to choose a canister vacuum that will meet your needs and preferences. With so many choices being available, it can feel overwhelming to sort through them and separate the good quality canister vacuums from the ones that should be passed over. There are several things that you want to take into consideration before you purchase a canister vacuum for your home. These factors will help you choose the right vacuum for your cleaning needs. What type of flooring do you have? – Canister vacuums tend to do better on bare floors but there are models that can clean even carpeted areas well. 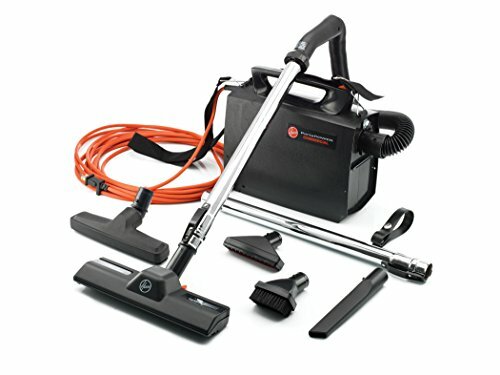 You want to look for one that has a powered on/off brushroll or one that offers a dedicated powered attachment that is specifically for carpets. Do you have pets? – Pet hair can be a real problem for some vacuums so look for a canister vacuum that has a pet hair attachment. These attachments may be in the form of a brush or an attachment with rubber fingers that grab pet hair from soft surfaces. Crevice tools can be used to vacuum pet hair from corners and crevices and the regular upholstery brushes can be used to remove pet hair from furniture. Are allergies an issue? – If anyone in your home has allergies, purchasing a canister vacuum with a HEPA filtration system will help improve air quality and get rid of a lot of the airborne allergens and particles floating around. How large is your home? – If you have a two story house with many rooms, you want to purchase a canister vacuum that is easy to maneuver around and carry. If you have an open floor plan all on one floor, you can get away with a heavier model that isn’t as maneuverable. Does Bagged or Bagless matter? – This decision is a personal preference call. While bagged canister vacuums have to have replacement bags purchased, bagless varieties have to be emptied a lot more often which can be messy and annoying. 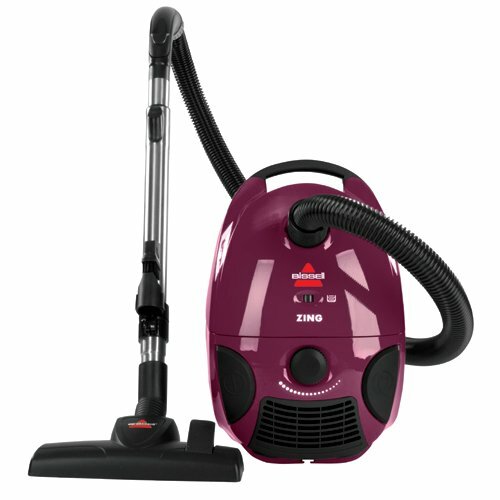 When you start looking to purchase a canister vacuum, there are certain things that you want to look for. We have listed the most popular features that usually make up the higher quality canister vacuums. You may want all of them in the vacuum you choose or you may only be interested in certain ones. Wide cleaning path – Most cleaning paths range anywhere from 10-15 inches wide. The wider the cleaning path of the vacuum is, the fewer passes you’ll have to make when cleaning larger rooms. Long Power Cord – A long power cord of at least 20 feet long means that you won’t have to keep changing outlets. Some canister vacuums have power cords as long as 33 feet long. Cord wraps are a must, and if possible a retractable power cord is even better and more convenient. Long Hose – A long hose gives the user more reach, especially when the attachments are on the end of it. Larger Dirt Capacity – The larger the capacity is the less often you will have to be bothered with changing out vacuum bags or emptying dirt bins in the bagless varieties. Attachments – A variety of attachments is always a good thing when looking for a canister vacuum. Attachments such as crevice tools, upholstery tools, dusting brushes, floor brushes, pet hair tools and more are all very useful attachments to have. Lightweight Design – Canister Vacuums come in lightweight models and heavier models. The weight range is usually between 9 and 24 pounds. The lighter canisters are much easier to carry up stairs and maneuver around. You want the canister vacuum you choose to be easy to handle which will avoid potential problems like back pain, fatigue and irritation. There are several things that will make the vacuum much easier to handle. We will list the things to look for in a vacuum that will make it easier to handle. Larger wheels will make the canister vacuum easier to maneuver, especially if you have carpeting in your home that is thicker. If the wheels are too small, they can get bogged down in thick carpeting or be stuck by power cords rather than simply rolling over them easily. The weight of the vacuum also plays a large part in how easy it is to handle. You don’t want to have to drag a heavy machine around behind you as you vacuum or carry one upstairs that you have to struggle with. Lightweight doesn’t have to mean flimsy or low quality. Just be certain to check all the other factors that we have provided to ensure that the vacuum is good quality. If you need to carry your vacuum such as up or down stairs, you will want there to be a convenient carry handle so it is easier to maneuver. A long power cord of at least 20 feet will allow you to vacuum the entire room without having to change outlets. If you have large rooms, this feature is very convenient. Power cord length will vary according to the model and make of the vacuum. Rubber casings around the canister will prevent damage to the canister as well as damage to woodwork, walls and furniture as you are vacuuming. Look for telescopic wands that make cleaning drapes and ceiling corners easier. This will be much better than stretching and reaching. Easy to reach controls are also very convenient. You don’t want to have to search for them. Controls can be located on the canister or on the wand itself. The controls on the wands prevent you from having to bend over to turn on the vacuum. If they are on the canister, you may be able to use your foot to turn it on and off. Always look for a canister vacuum that offers a warranty. A company that offers a warranty on their products shows that they trust their own product and that should give you additional peace of mind. Warranties can range from one year up to 5 years or more. The longer the warranty the better if at all possible. Finding a good canister vacuum will take a little bit of time and research. Having a good quality vacuum means that you will be able to keep your home clean much easier. With all of the choices available, choosing the right canister vacuum may seem like a challenge but we have taken care of the work for you by providing you with this buyer’s guide. The right information makes sorting through the choices much simpler so you can find the one that will meet your cleaning needs and preferences. Having the knowledge of the product you are researching gives you the ability to make an informed decision that will meet those needs help you achieve the clean house you want. Sarah's passion for cooking and eating healthy is what drives her to research and educate others. Sarah is our expert researcher who manages the Home and Kitchen category. When she's not writing you'll find her listening to Paleo Diet podcasts and educating people on how to live and eat primally.